Everyone makes lemonade when life gives us lemon. But a foodie thinks differently and she rather chooses to make some lemon curd. So few months back when I was endowed with huge piles of bananas I exactly knew what I was making. This dates back to this when my uncle was hospitalized for his bypass surgery. Its another story that the operation took him a whole of 3 months to finally being discharged from the hospital.He kept going in and out of the hospital for several wrong reasons and negligence of the doctors.Thank God that he is finally fine and has joined work as well. My Meso works for Idian forest department and is an avid gardener. In their ancestral house they have a huge garden where every variety of fruits and vegetables are cultivated. It was pretty obvious that everyone who came to visit him during his stay brought bagfuls of fruits and vegetables from their garden. The variety kept on changing. Sometimes it was bagful of spinach, pointed gourds, brinjals and other times it was pumpkin, bottle gourd and mangoes. But one thing that was pretty constant to appear on a weekly basis was banana. Every time someone came, they brought bunches of banana, consisting of 50-60 fruits. So much so that even after eating them for breakfast, evening snack and after dinner dessert we had huge piles of bananas. My so deep fry loving maternal uncle jumped with joy and advised us to make some kalar bora or sweet banana fritters. But I went bananas at the thought of using so much oil. So I came up with this idea of making eggless banana muffins, full of nutrition from almonds and banana…healthy and delicious. The best part is it’s easy to prepare, easy to store, easy to carry and one can enjoy this as a snack or as a nutritious dessert. With this in stock you are sorted. 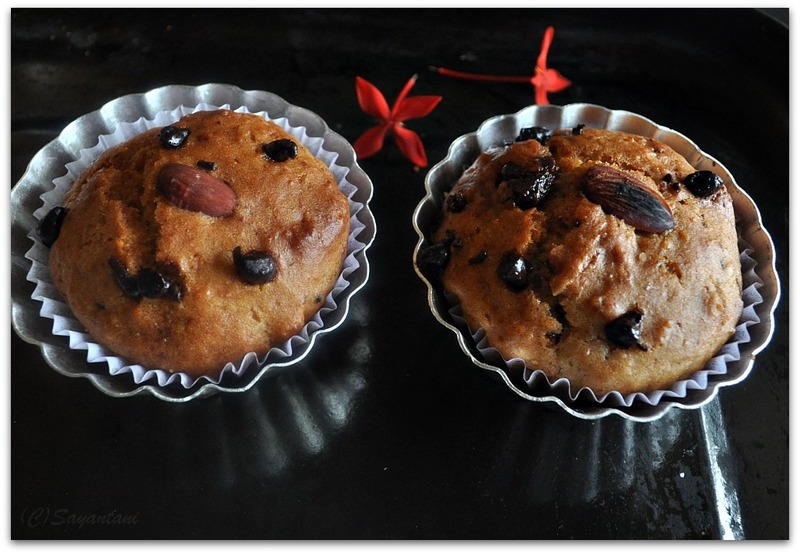 Serve them to your sudden guests, pack them for hubby’s evening sncak or kids tiffin box. Everybody loved it when I first served it with evening tea. When my MIL who does not have much appetite for sweet things(including me*) reached for the second muffin I knew it’s seriously good. On another note I went through a root canal treatment this weekend and its painful. while I recover and kill time with the internet you enjoy this recipe. Here is my version of turning scrap to fab! This keeps well for 3-4 days in covered container in fridge. You can substitute cinnamon powder with vanilla essence. I like the baked banana flavour so dint use any. Use honey instead of sugar. that gives a beautiful flavour. it could also be baked as a cake. in that case use a 8" round pan and bake for 30-35 minutes. or alternatively use a loaf pan. 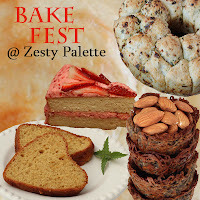 Sending this to Vardhini's bake fest#1 at zesty palette. Muffin looks so inviting and spongy. Perfect muffin. U have clicked it so beautifully tht I am seriously craving for one...Looks so yummy sayantini....hope u have a lovely week ahead! That is indeed a healthy and wonderful recipe! Wud love to try it! 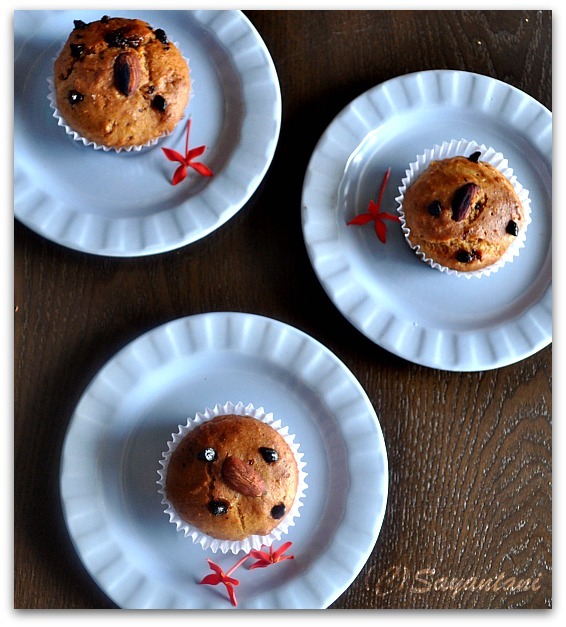 Absolutely stunning shots, the muffins look spot on and best ever indeed! 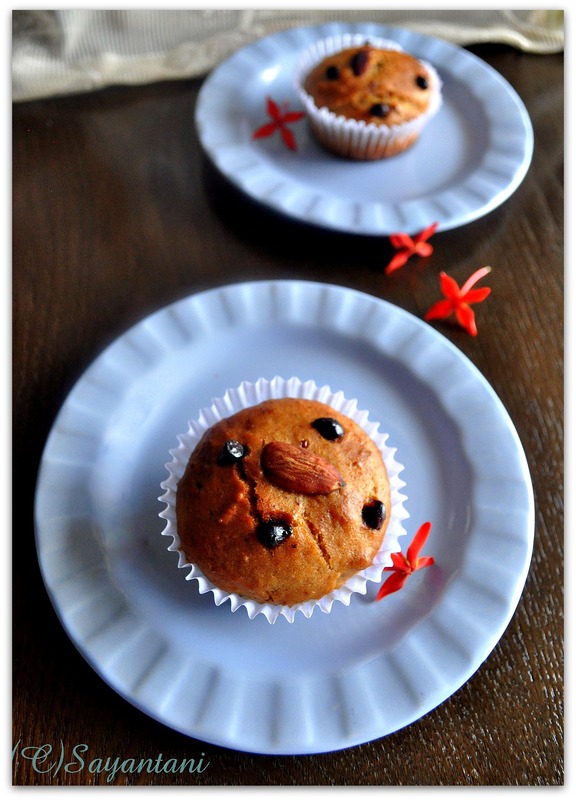 Stunning pics of egg less muffins. Awesome preparation. 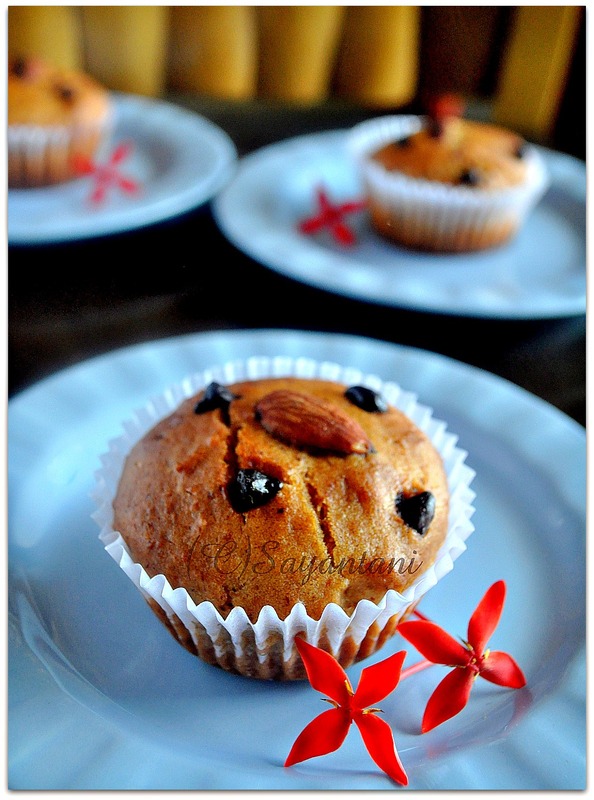 Prefectly baked muffins, looks absolutely divine. very yummy n delicious..looks spongy n soft!! Nice presentation..Glad to know its Eggless..
Hope you're feeling better. A also went through one and it's not fun. The muffins look delish. 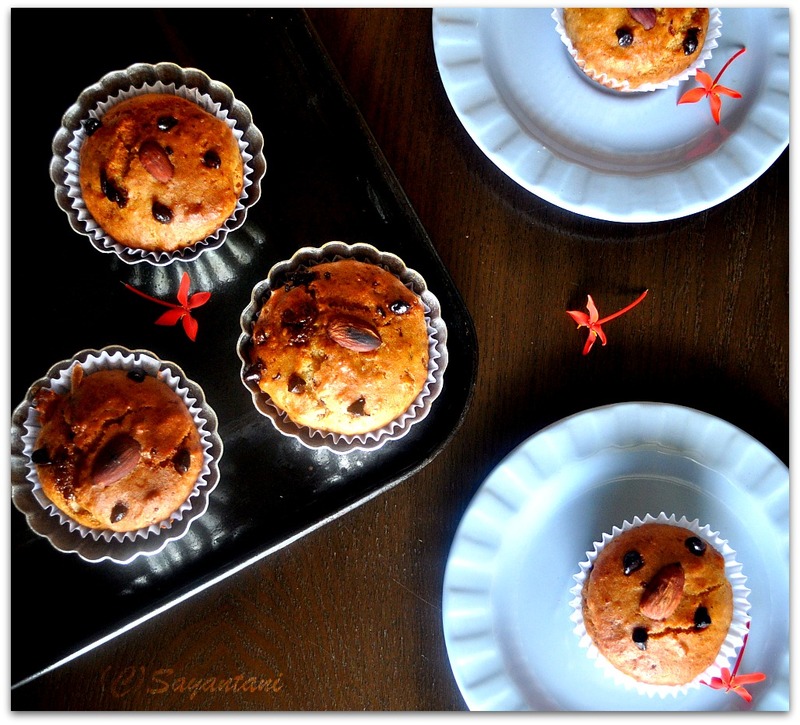 Perfect-looking muffins! Amazing clicks and presentation as usual..Hop you will be fine soon, Sayantani..Take Care. Yummy! 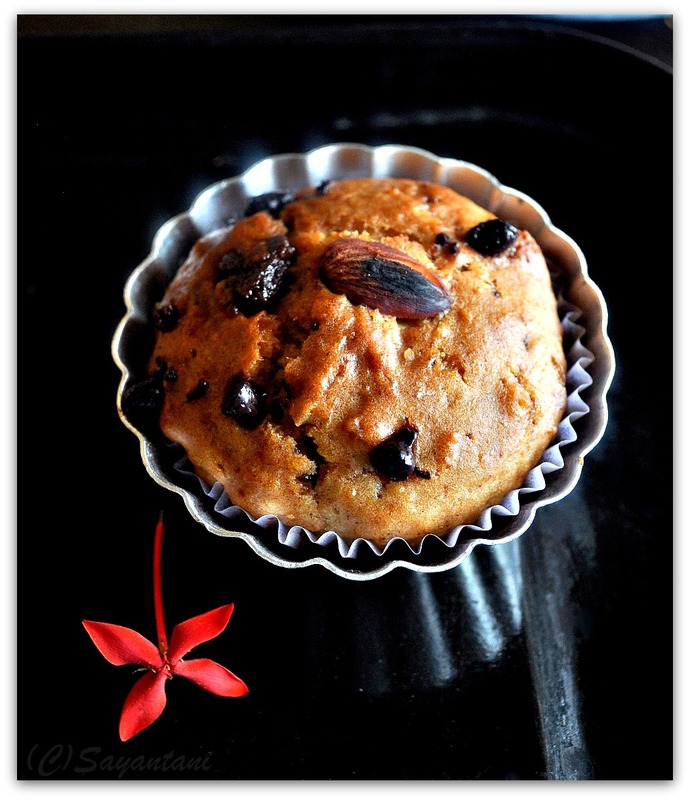 !Banana in bakes is my son's favourite!! I too love the taste especially when they are warm:) And you take care my girl, root canal...you are such a brave girl!! I am absolutely traumatised by dentists!! How all is well with you. Great recipe too. Lovely fluffy muffin! And the good thing about muffins is that they can be frozen and then microwaved for a quick snack or tea time treat! banana is my favorite...love your sense of styling ! superb!! those muffins look so mouth melting!!.. thanks so much for dropping in.. It really means a lot to me :).